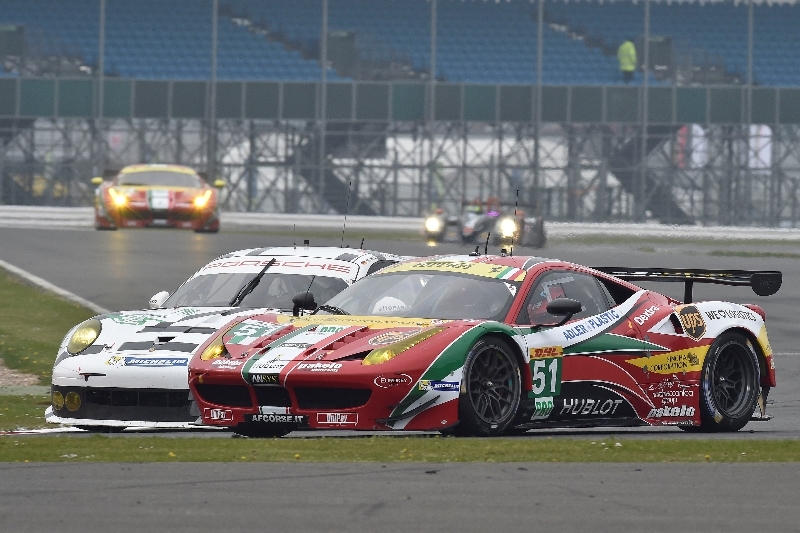 Silverstone, 20 April – It was a bitter Easter for Ferrari in the first race of the FIA WEC (World Endurance Championship) in England. 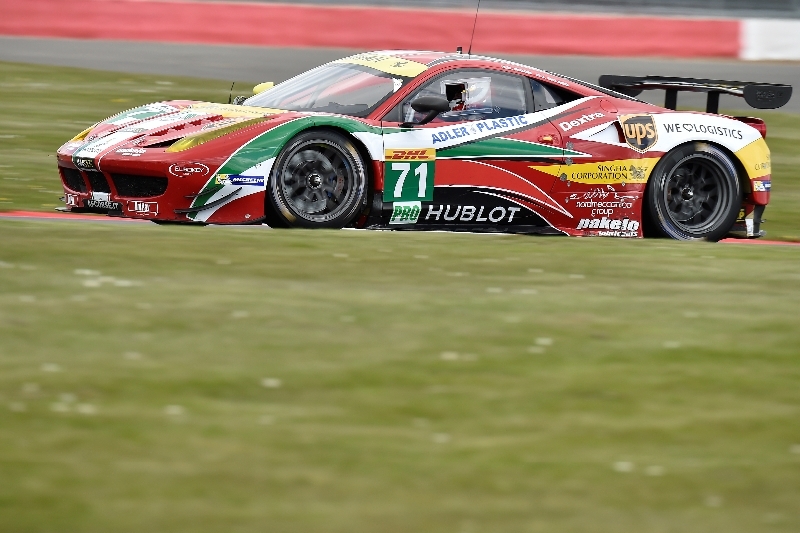 There was just one podium to show from the two categories in which the Maranello company was involved, the LMGTE PRO and the LMGTE AM. 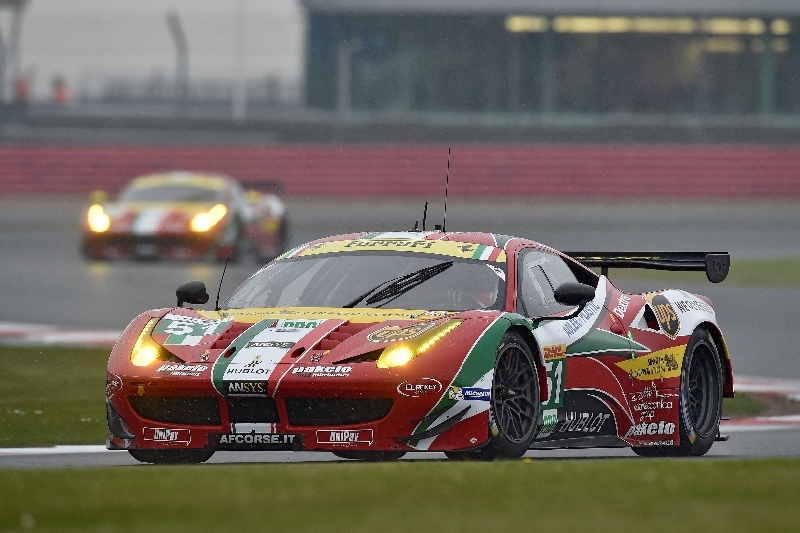 The race was characterised by rain, which had such an effect on the competition that it even drew proceedings to a halt almost half an hour early. 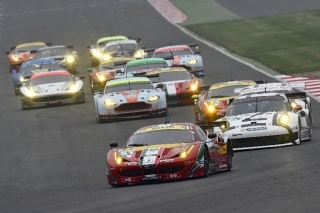 The race director was forced to bring out the Safety Car because of the intensity of the rain and shortly afterwards he had to call time on what should have been a Six Hour race once the track had become effectively unusable. 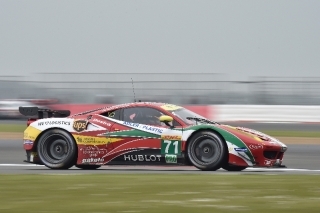 The joke was on the Ferrari of the world champion “Gimmi” Bruni and Finland’s Toni Vilander who had stopped in the pits to put on full wet tyres just a few seconds before the safety car came out onto the track. 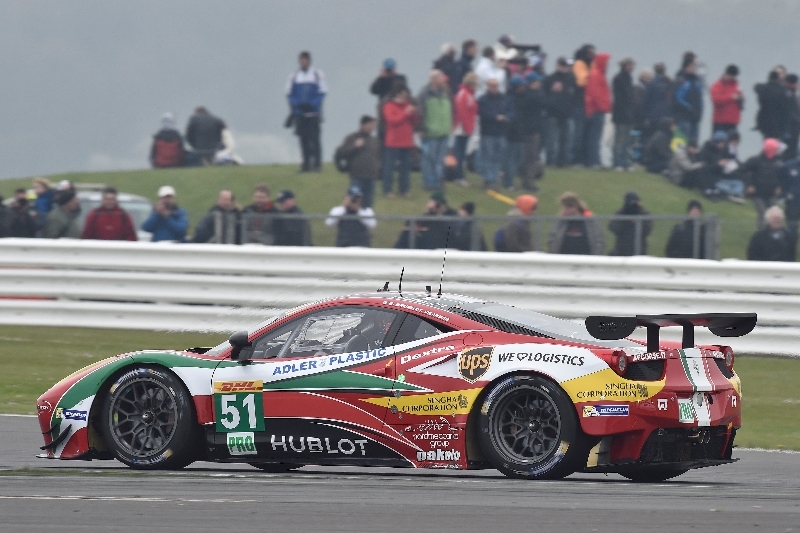 That stop for Bruni and Vilander meant they lost the third position that the team comprising the world drivers’ champion had held until that point, behind the Porsches which as expected could not be caught in wet conditions. 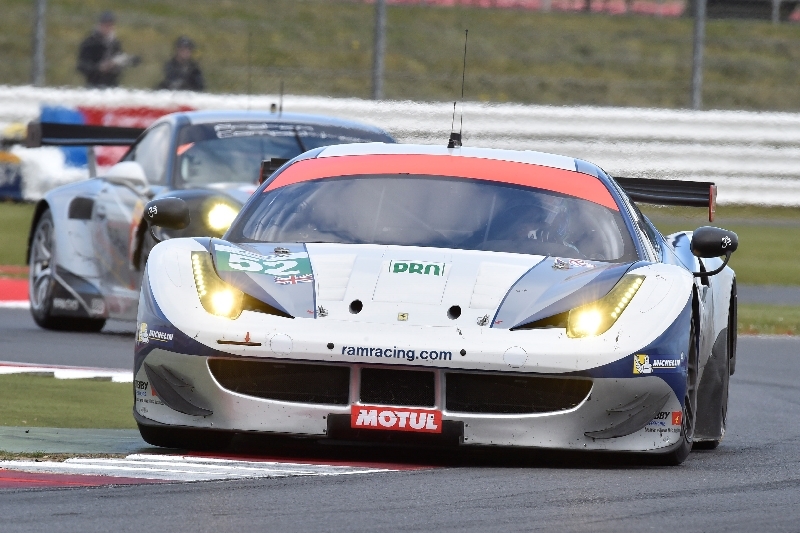 Victory in the LMGTE PRO class therefore went to the Porsche number 92 run by Team Manthey and driven by Makowiecki-Holzer-Liezt which defeated their team-mates Pilet-Bergmeister-Tandy and the Aston Martin of Turner-Mucke. 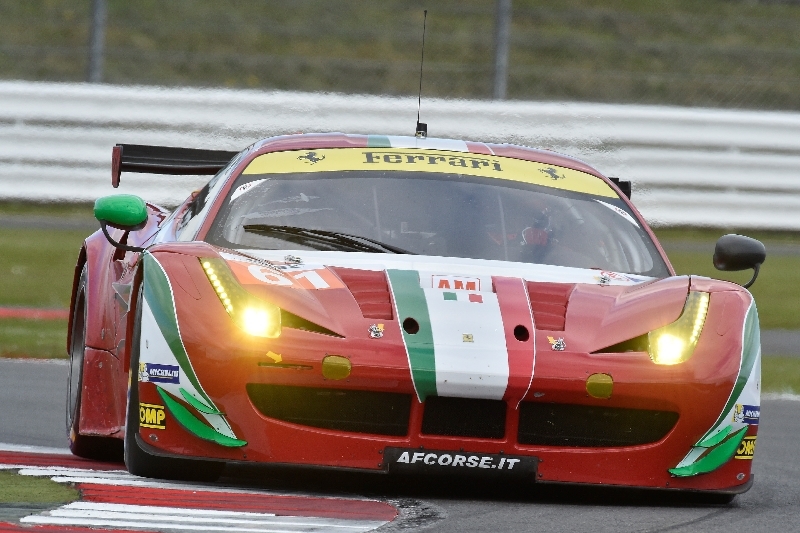 Bruni and Vilander came home ahead of the other AF Corse car, driven by youngsters Davide Rigon and James Calado. 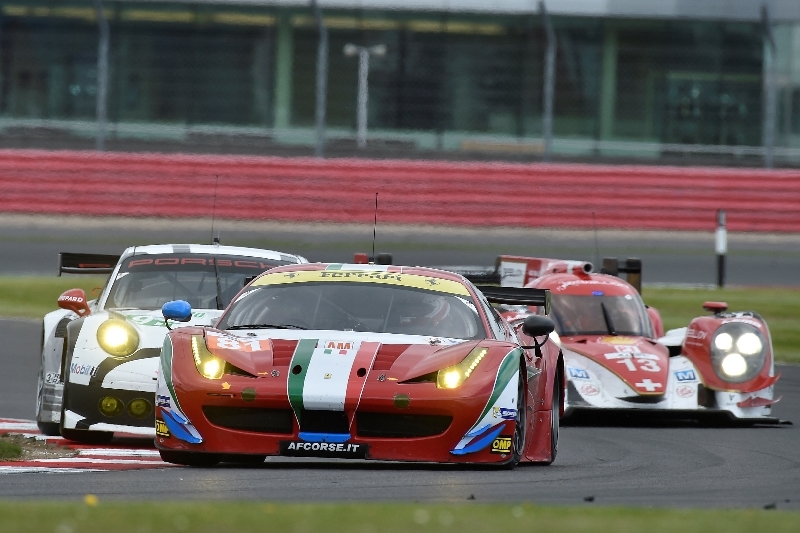 Ferrari’s only podium therefore arrived in the LMGTEAM class thanks to Michele Rugolo, Australia’s Steve Wyatt and the British ex GP2 driver Sam Bird. 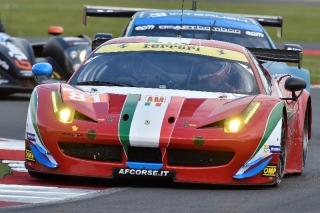 The trio, with the number 81 car of AF Corse, in fact took third place just behind the Aston Martins of Poulsen-Hansson-Thiim and Della Lana-Lamy-Nygaard. 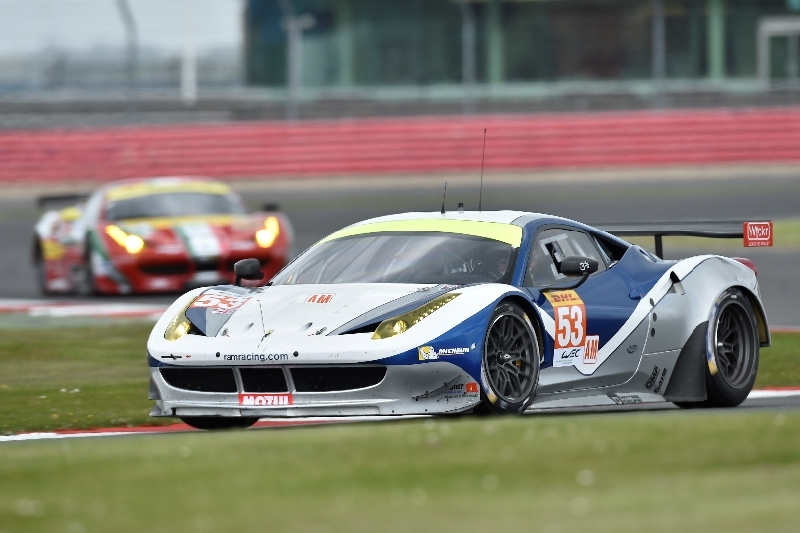 The overall race was won by the Toyota of Sebastien Buemi, Nicolas Lapierre and Anthony Davidson. The next round of the championship will take place on May 3 at Spa Francorchamps. 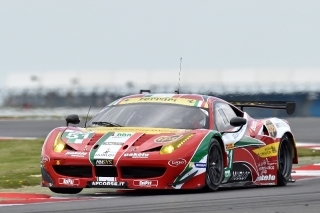 Silverstone, 19 April – World champion “Gimmi” Bruni and Finland’s Toni Vilander, at the wheel of the Ferrari 458 of the AF Corse team, set the best time in the LMGTE Pro class during qualifying for the Six Hours of Silverstone, the first race of the FIA WEC (World Endurance Championship) season. 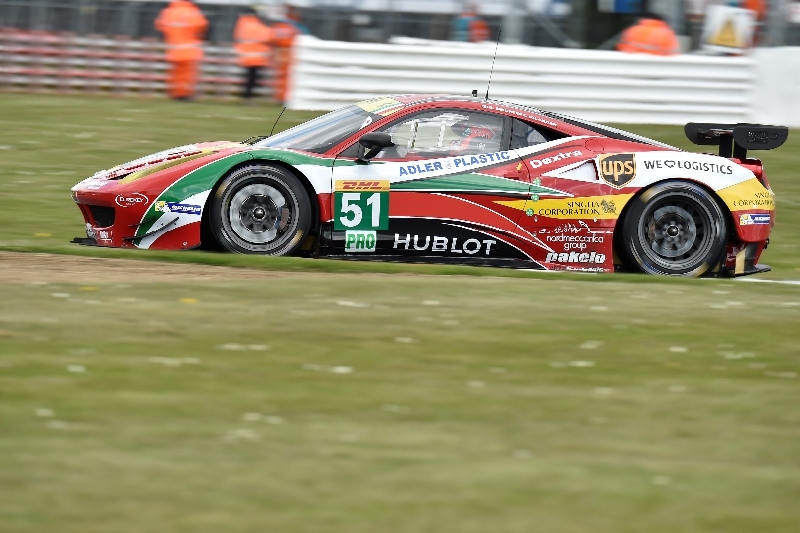 The number 51 car got the better of the Porsche of Pilet-Bergmeister-Tandy, ending up two tenths ahead with a lap of 1’59”125. 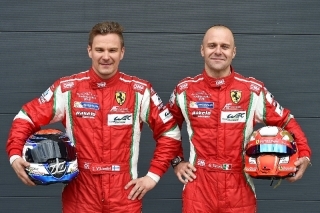 Bruni and Vilander, who had been trailing yesterday in free practice, thus made the most of their experience to take an outstanding pole position. 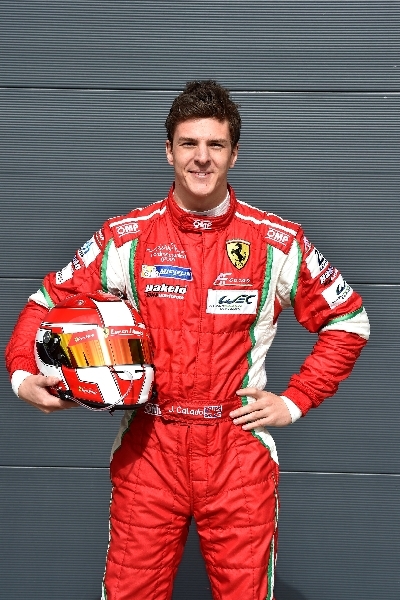 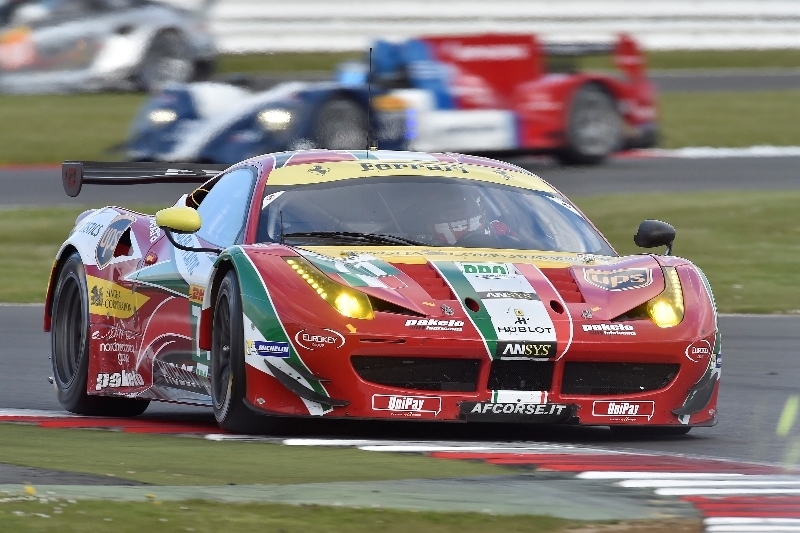 Fourth place went to the other AF Corse car, in the hands of young drivers Davide Rigon and James Calado. 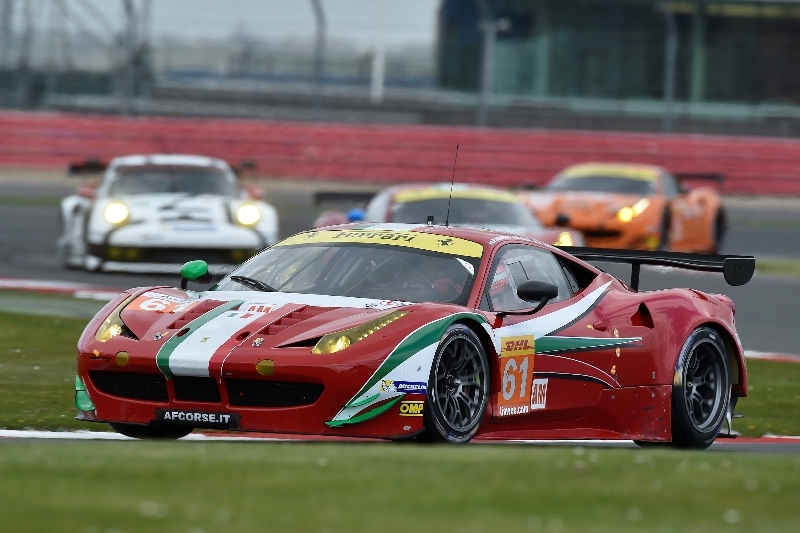 There was also a notable performance on the part of the Wyatt-Rugolo-Bird trio in the 458 number 81 also entered by AF Corse: the car is in fact taking part in the LMGTE Am category but it managed to take the overall fifth fastest time of all the GT cars with a lap of 1’59”932 putting many different cars from the top class behind them. 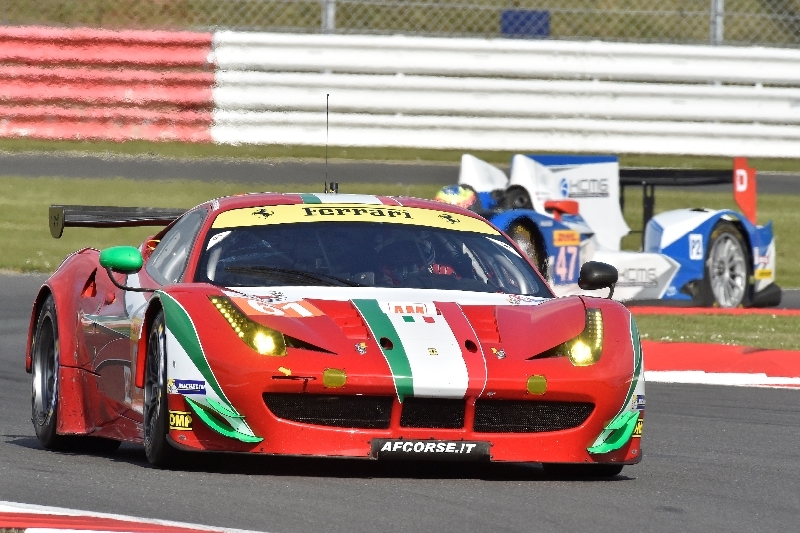 In that category fourth place went to the other Ferrari of AF Corse, number 61, that will be raced tomorrow by Argentina’s Perez Companc alongside Marco Cioci and Mirko Venturi. 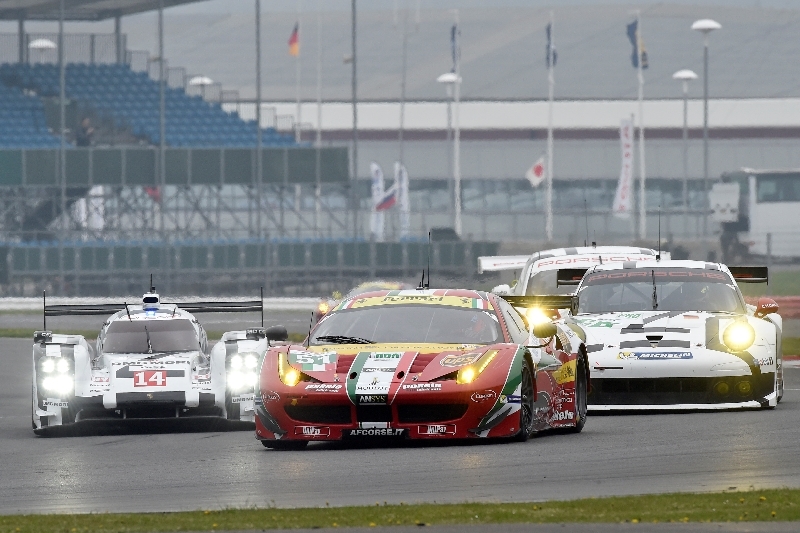 The best time overall in the LMP1 category was set by the Toyota of Wurz-Sarrazin-Nakajima with 1’42”774. 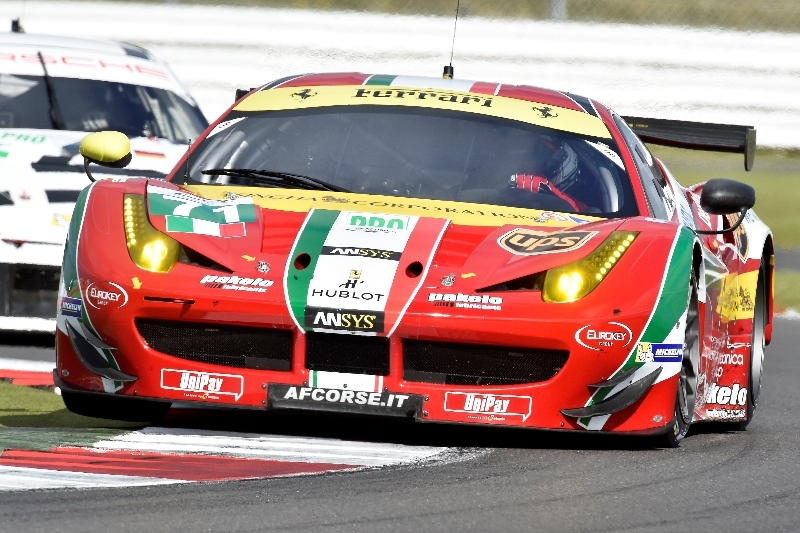 The race gets under way tomorrow at 1300 CET. 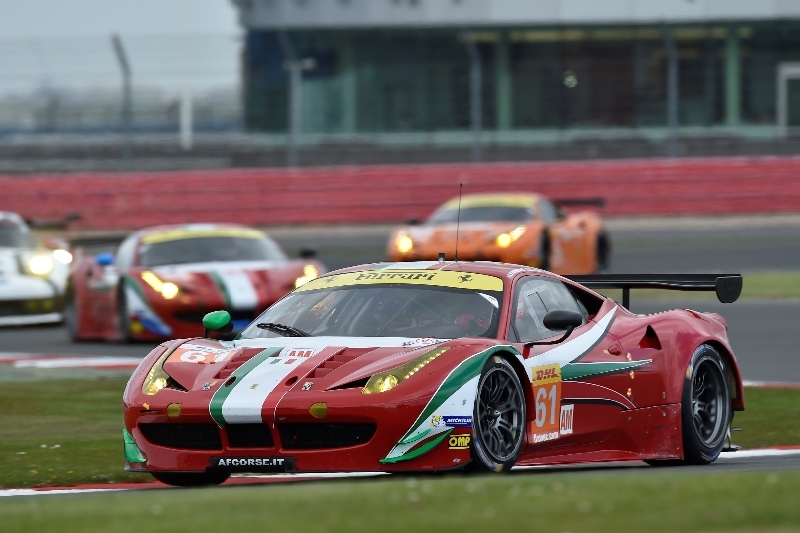 Silverstone, 18 April – Today saw the first two sessions of free practice for the opening race of the 2014 FIA WEC (World Endurance Championship). 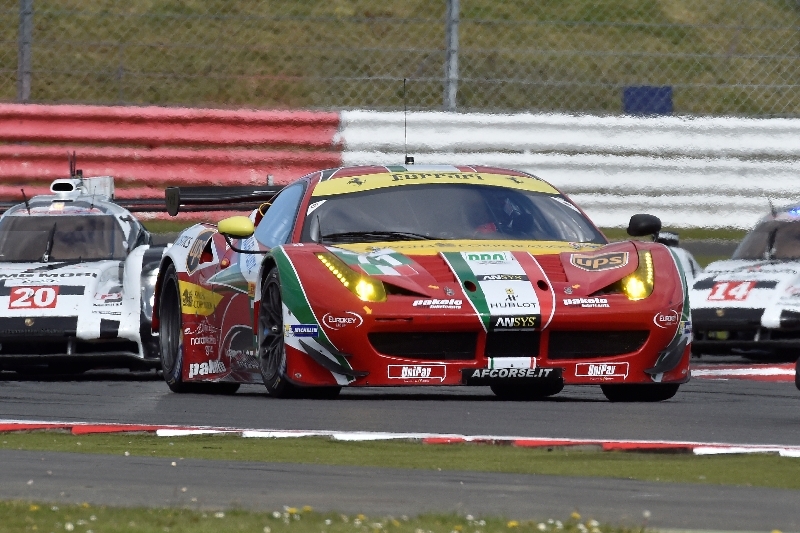 In the LMGTE, Pro and Am classes there was a great battle between the Porsches and the Ferraris. 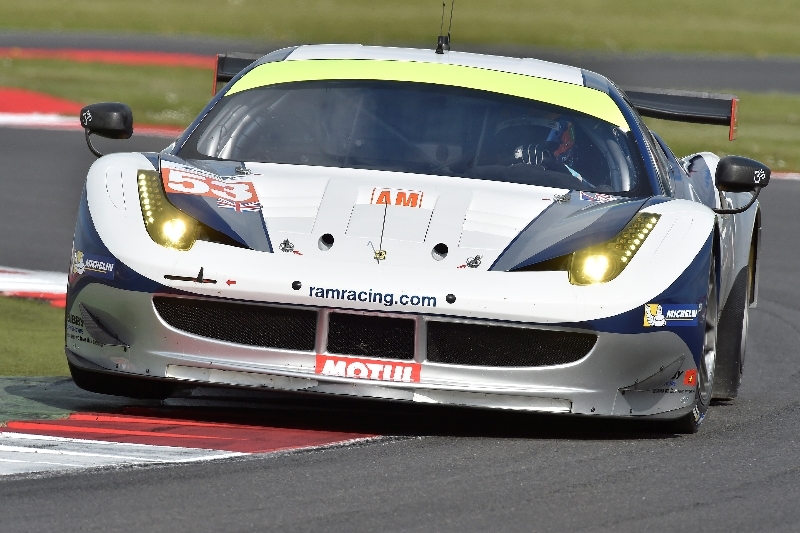 In the Pro category, the best time from the first session of free practice went to the Porsche of Pilet-Bergmeister-Tandy which stopped the clocks in 1’58”981. 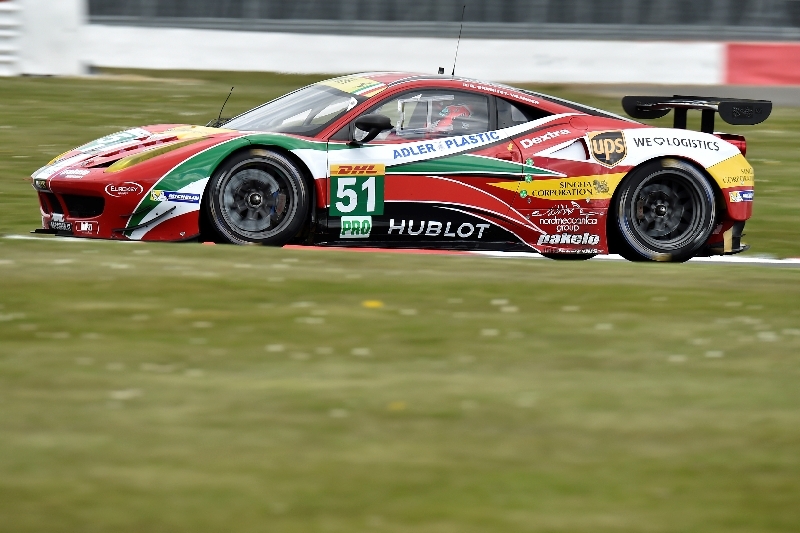 The first Ferrari was the number 51 of AF Corse driven by world champions “Gimmi” Bruni and Toni Vilander, who took third place in 2’00”519. 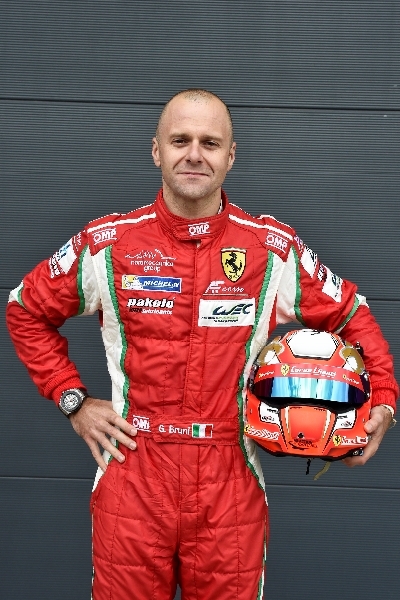 In the second practice session the best time (2’00”057, a lap which didn’t improve on the best lap of the first session) went to the other Porsche of Holzer-Makowiecki-Lietz while second place was taken by the Ferrari of the ELMS champion RAM team, for whom Alvaro Parente again proved his worth with a time of 2’00”268. 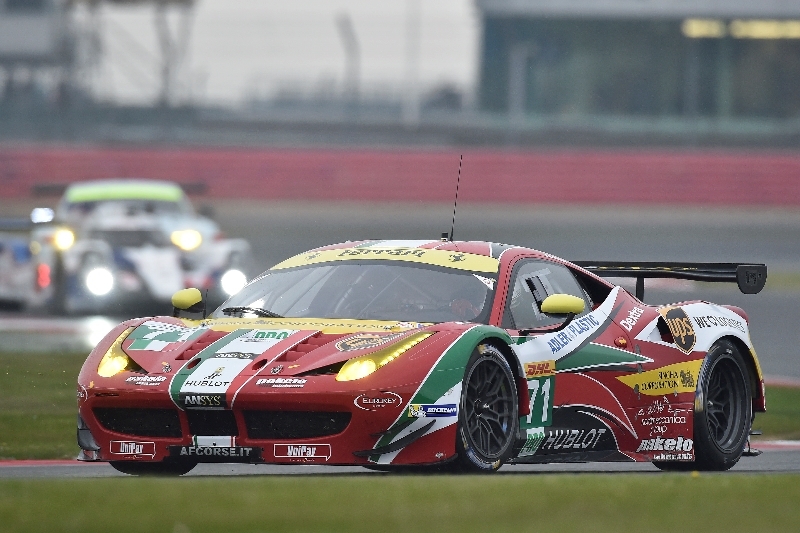 In the LMGTE Am class the Italian-German head-to-head was renewed. 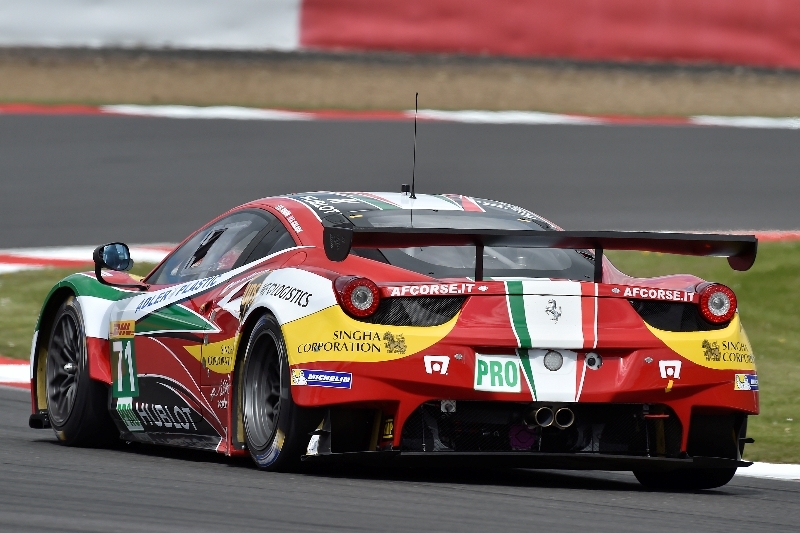 In the morning practice session the best time went to the Ferrari 458 number 81 of the AF Corse team with drivers Steve Wyatt, Michele Rugolo and former GP2 racer Sam Bird. 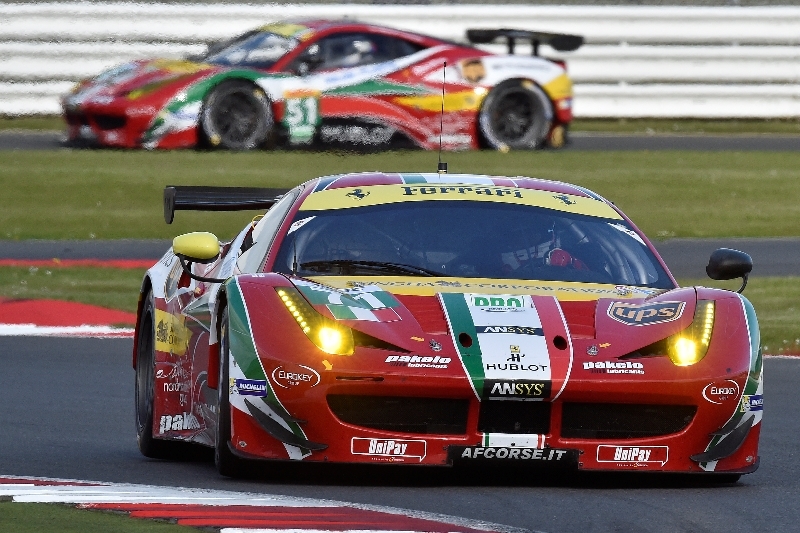 The mark set by the Maranello car was 2’01”210. 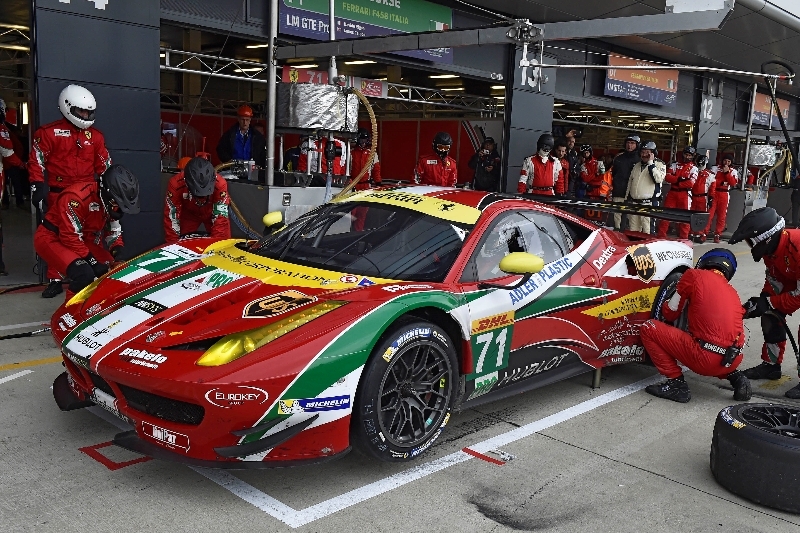 But Porsche hit back in the afternoon with the team of Ried-Bachler-Al Qubaisi which recorded a lap of 2’00”570 to pip by just over three tenths another AF Corse Ferrari, the number 61 of Luis Perez Companc, Marco Cioci and Mirko Venturi. 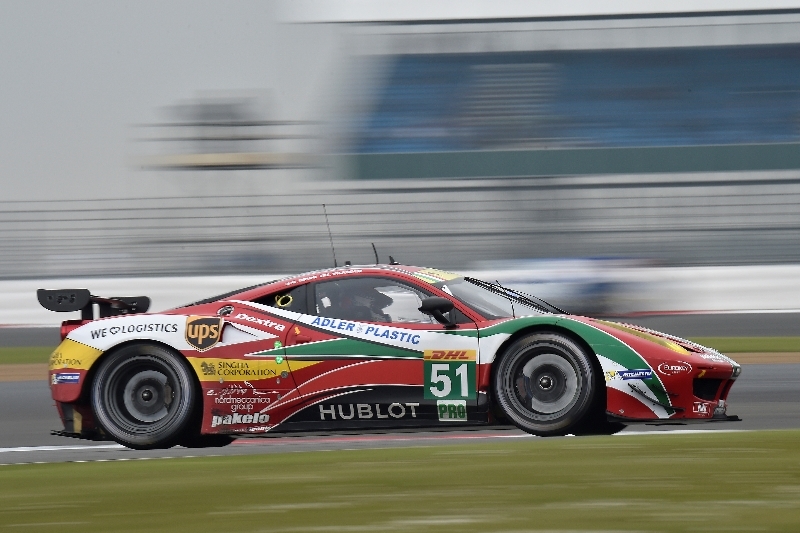 The overall best time was set by the Audi of Di Grassi-Duval-Kristensen in 1’43”144. 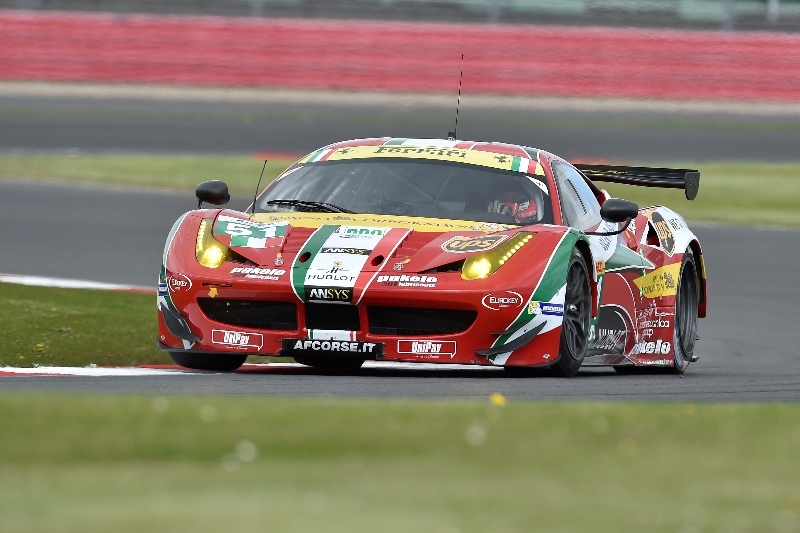 Tomorrow will see the third free practice session and qualifying before the Six Hours of Silverstone gets under way on Sunday at 1300 (CET). 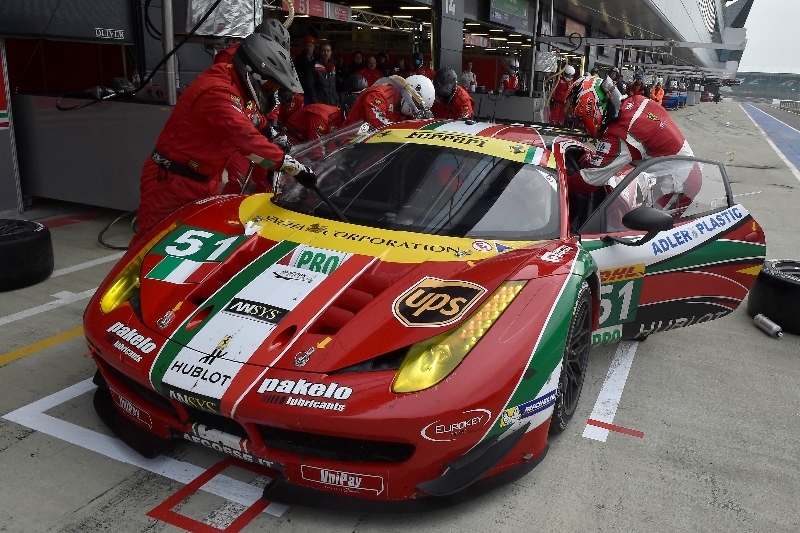 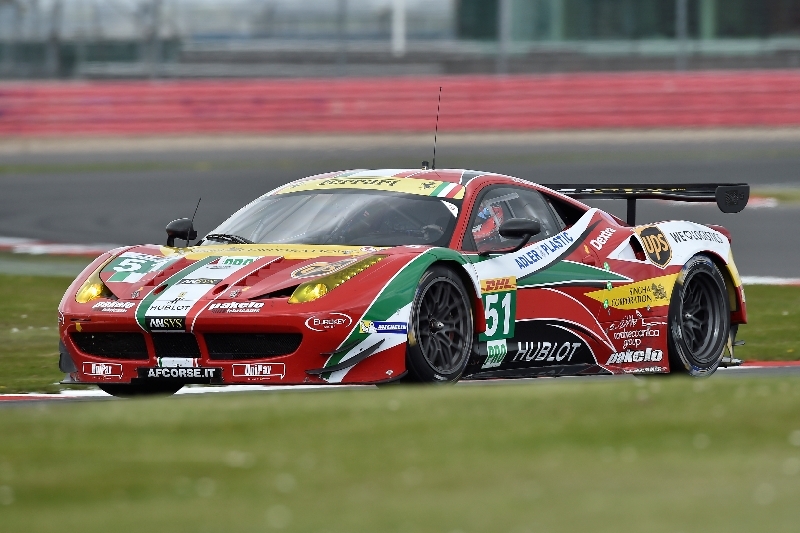 Maranello, 17 April –The FIA World Endurance Championship (WEC) gets underway at Silverstone tomorrow. 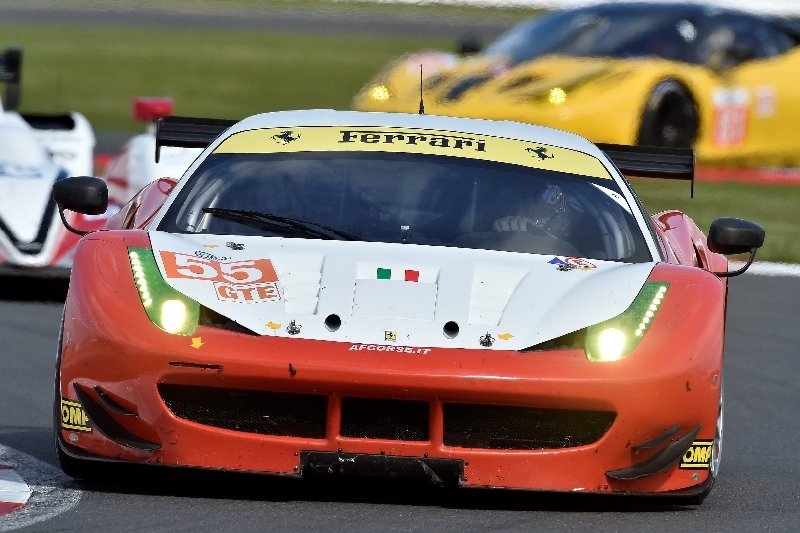 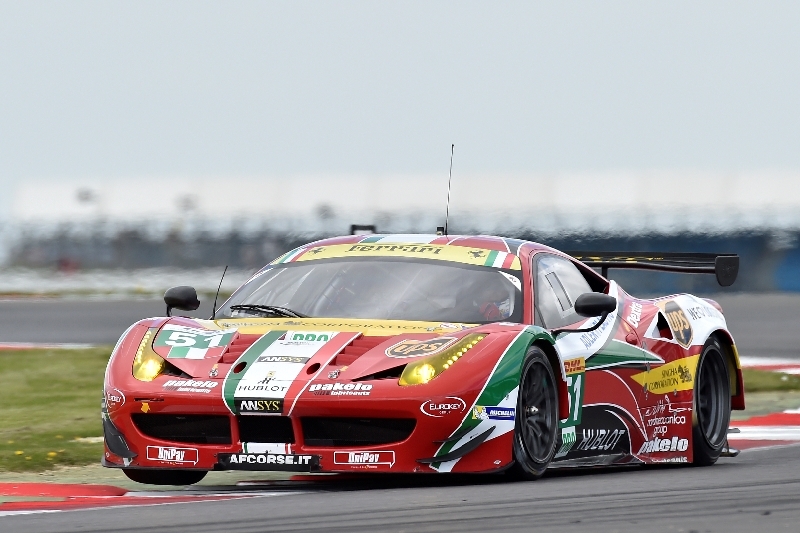 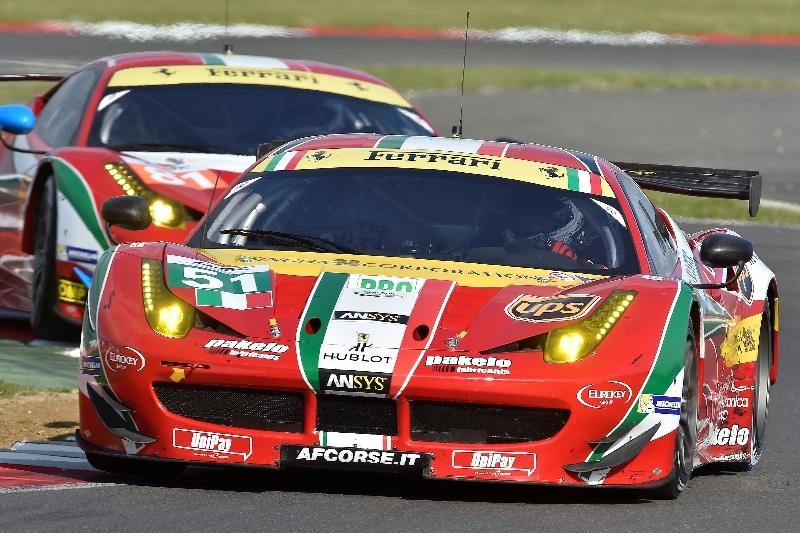 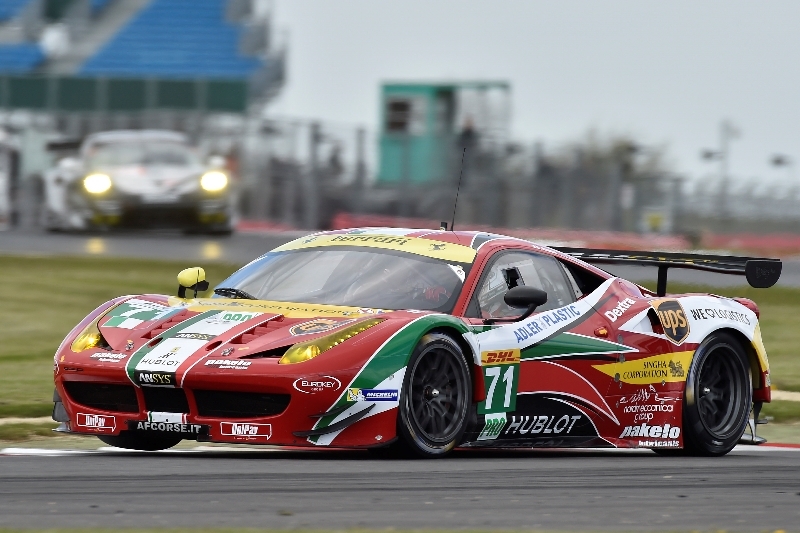 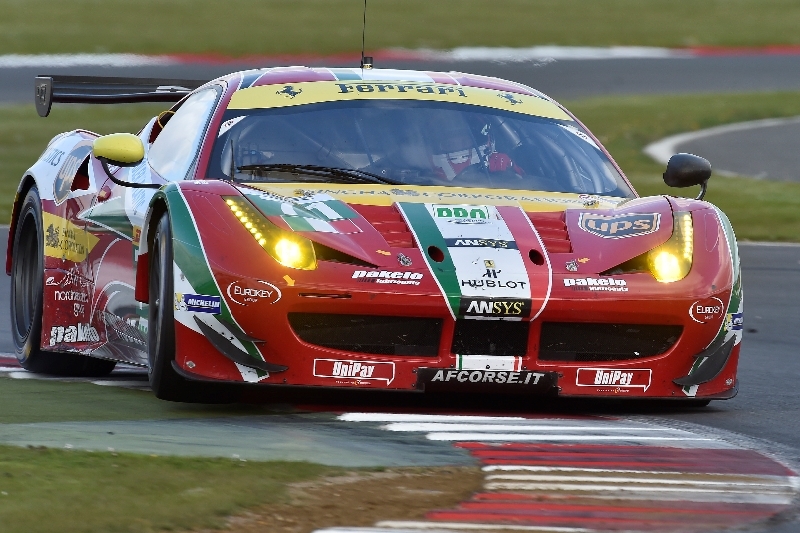 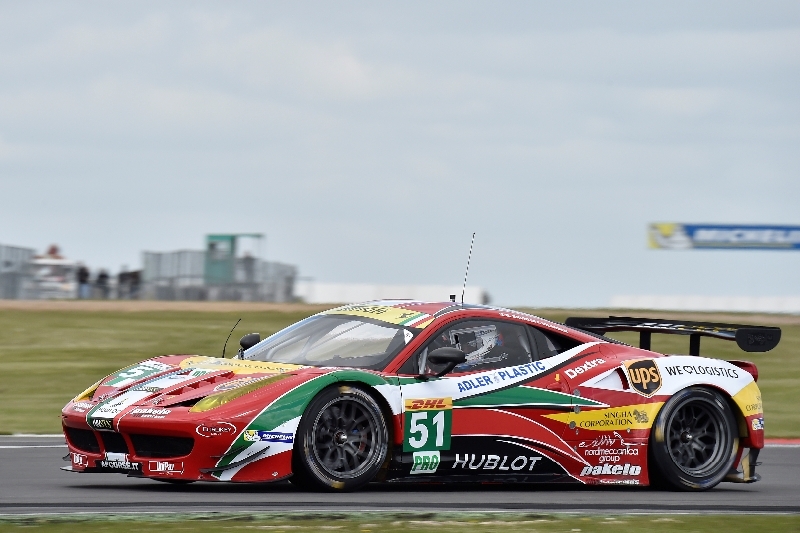 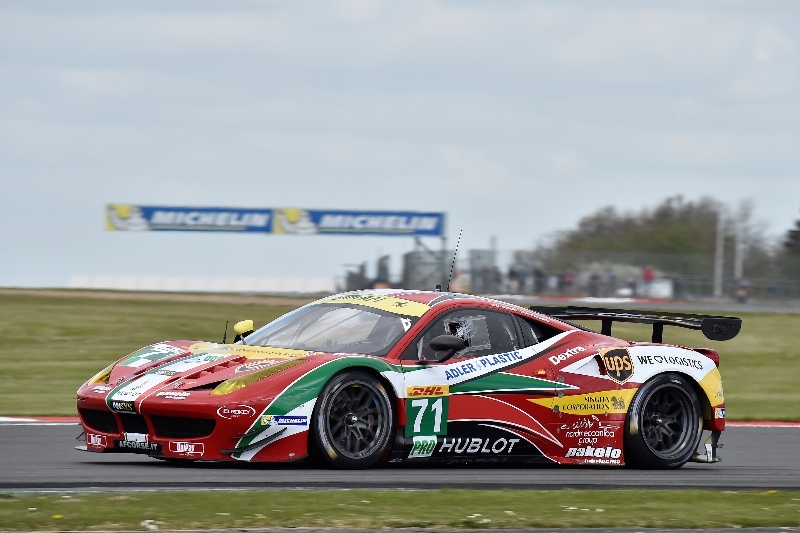 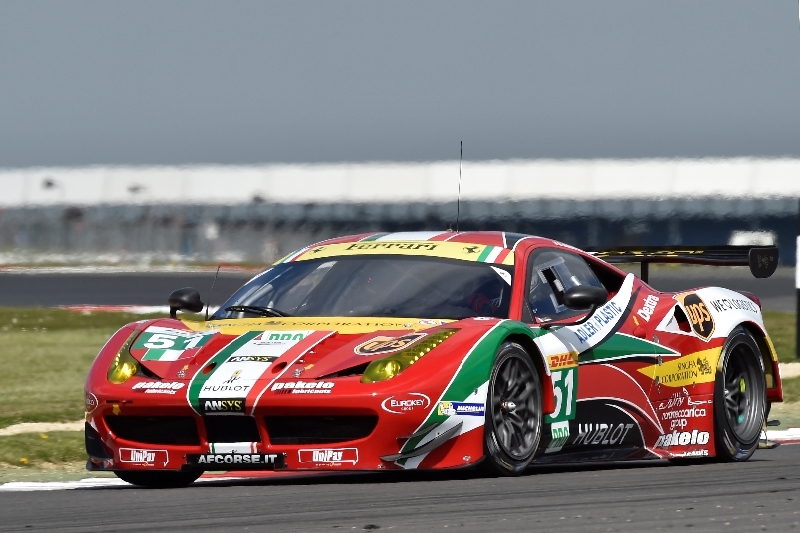 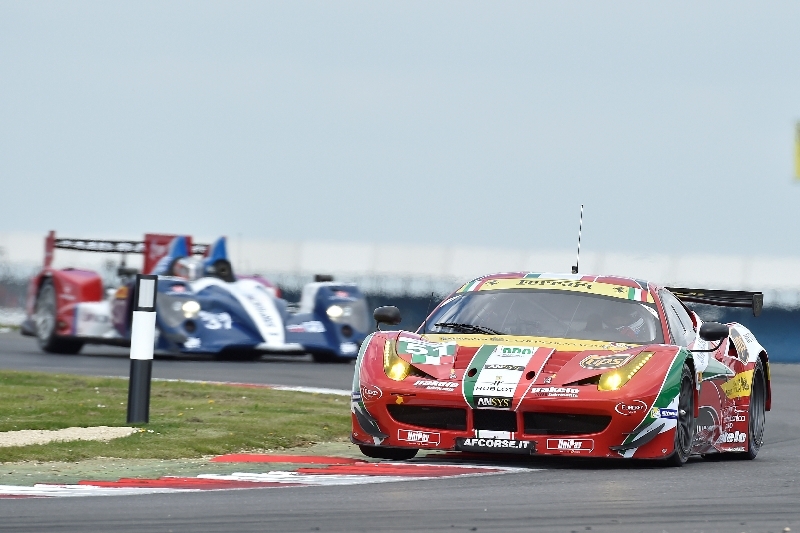 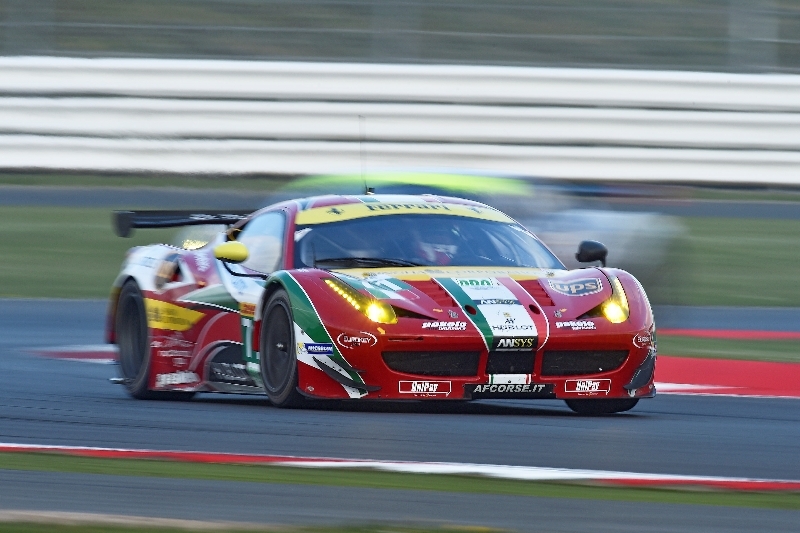 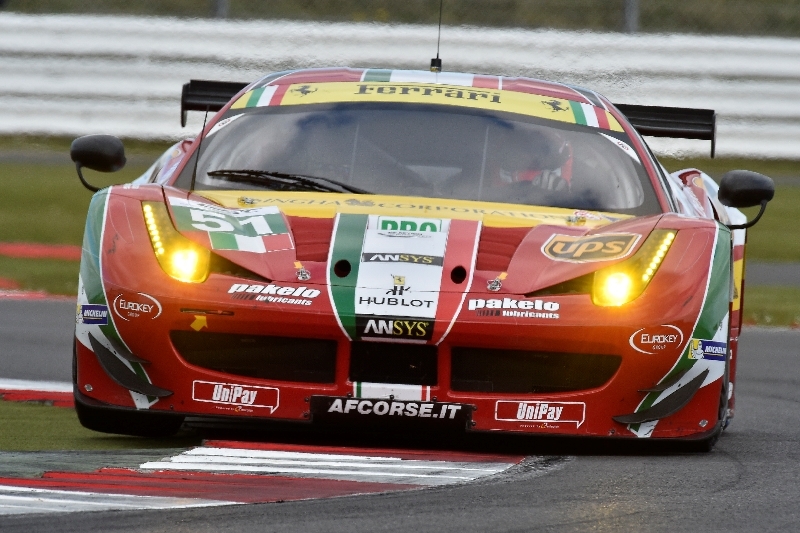 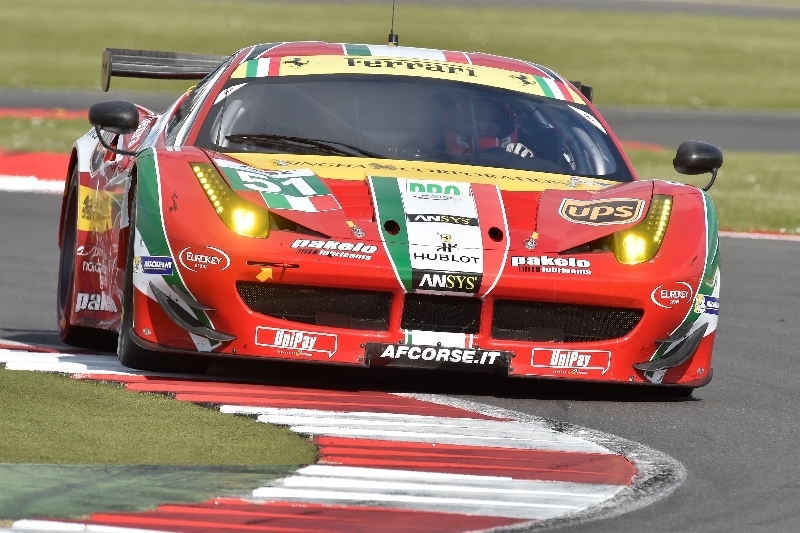 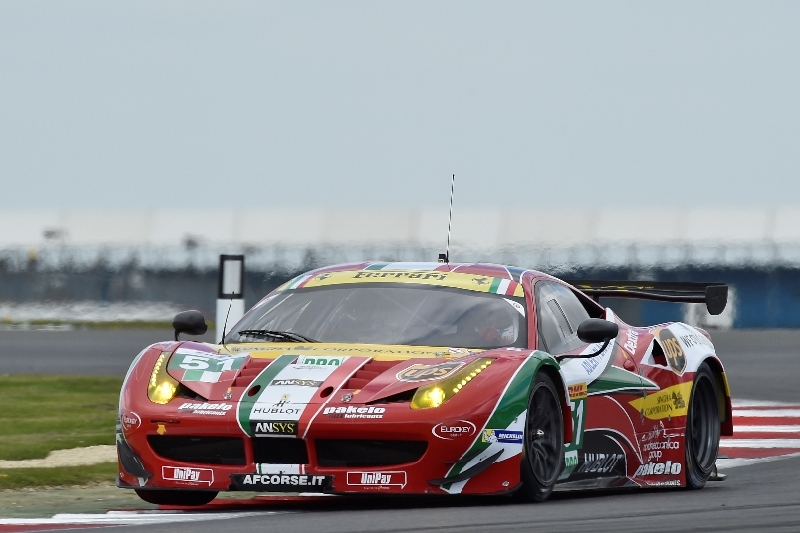 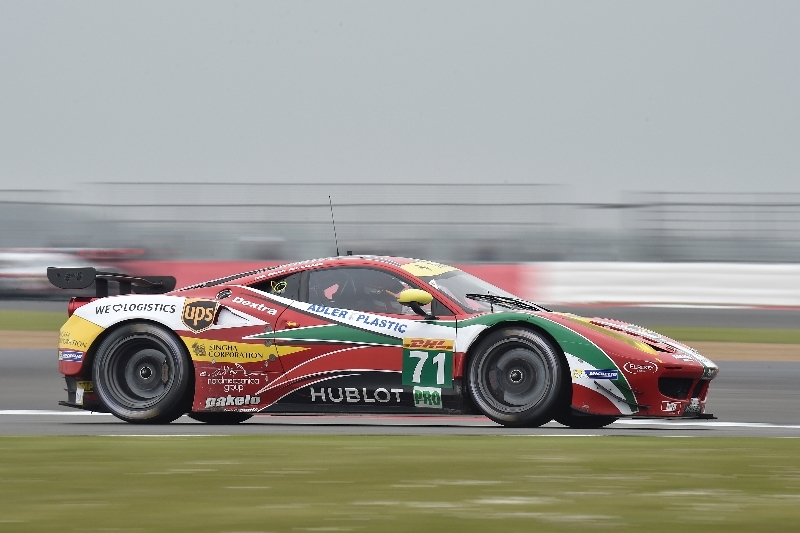 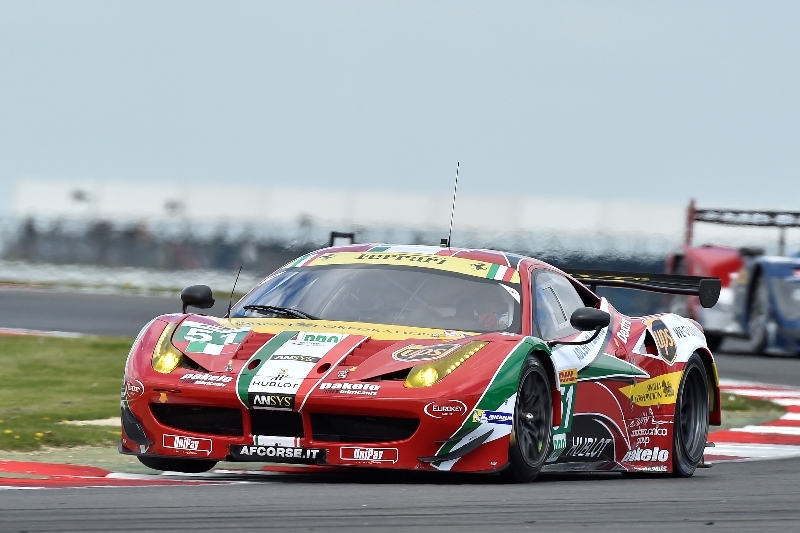 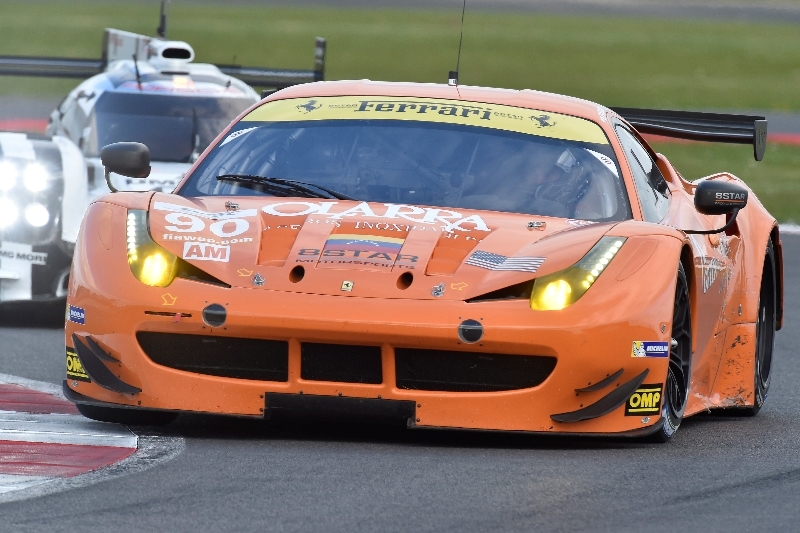 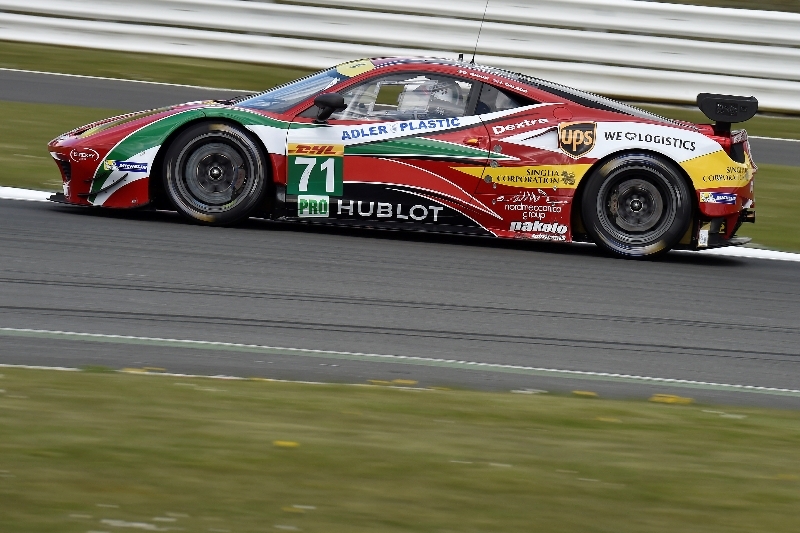 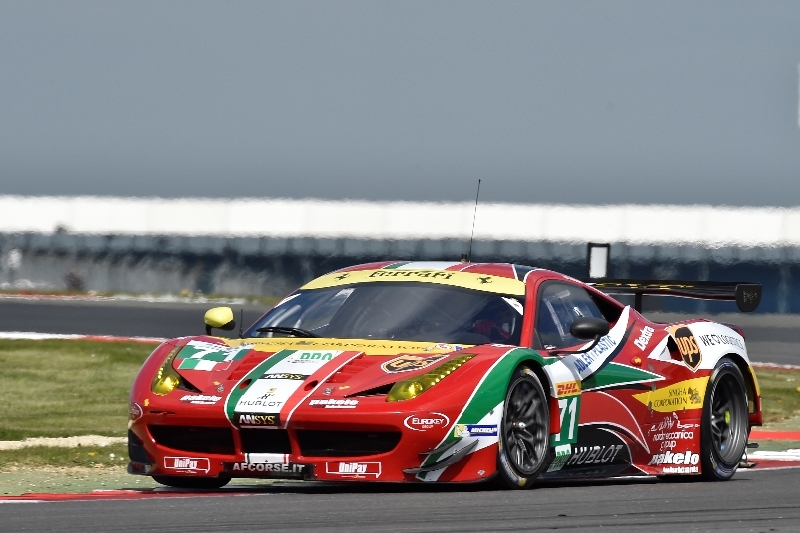 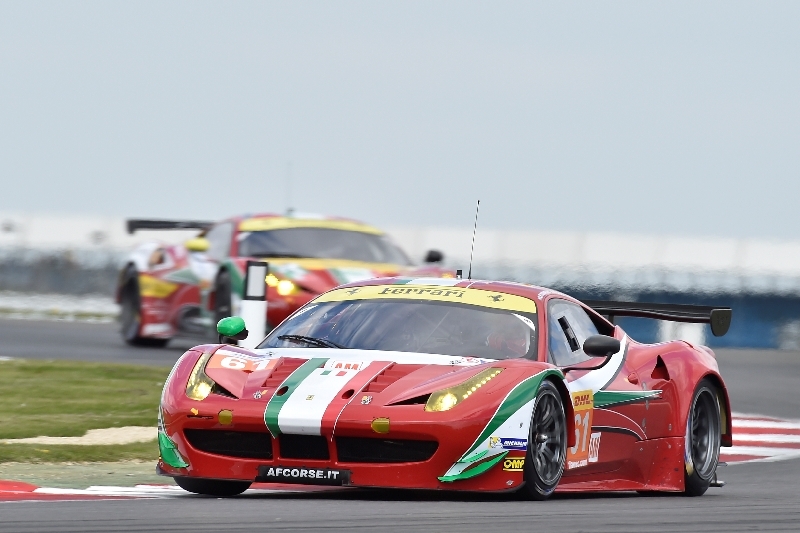 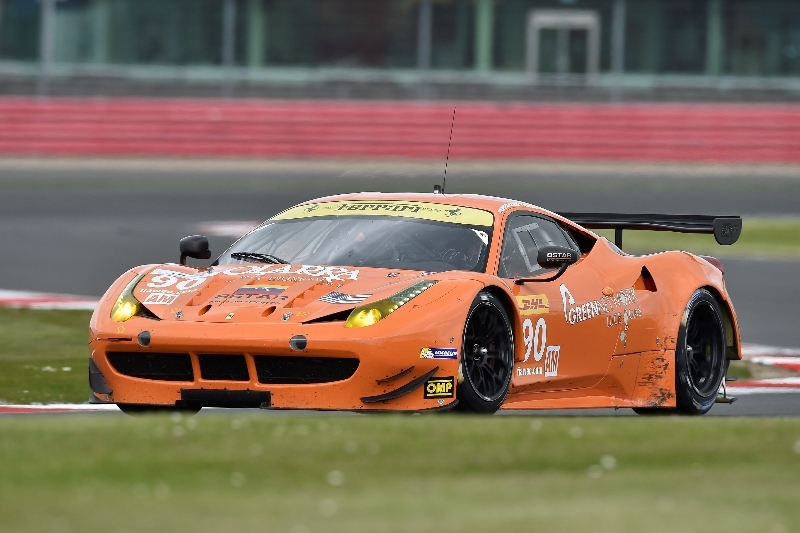 In the LMGTE PRO category, the reigning champions are the AF Corse Ferrari 458 Italia GT2 and “Gimmi” Bruni. 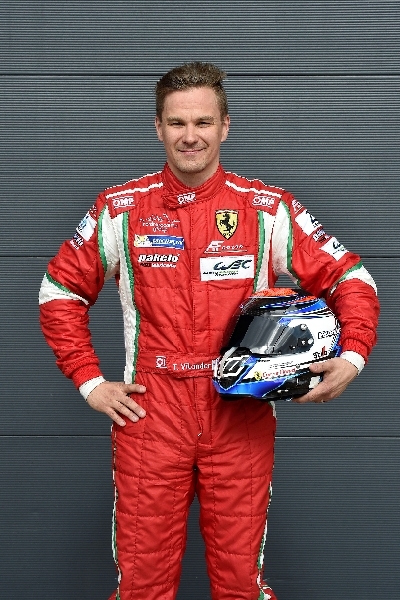 The driver from Rome is back paired with Finland’s Toni Vilander this year, in what many in the paddock regard as the crew to beat. 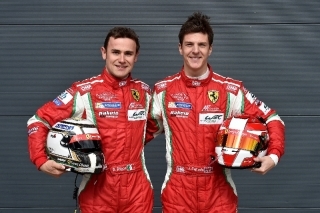 Driving car 51, across the garage from them are their two young team-mates, who come from the world of single-seaters: Scuderia Ferrari’s Formula 1 test driver, Davide Rigon and Englishman James Calado, who has tried a Force India Formula 1 car and has three years experience in GP2, taking four wins and finishing third in the 2013 championship. 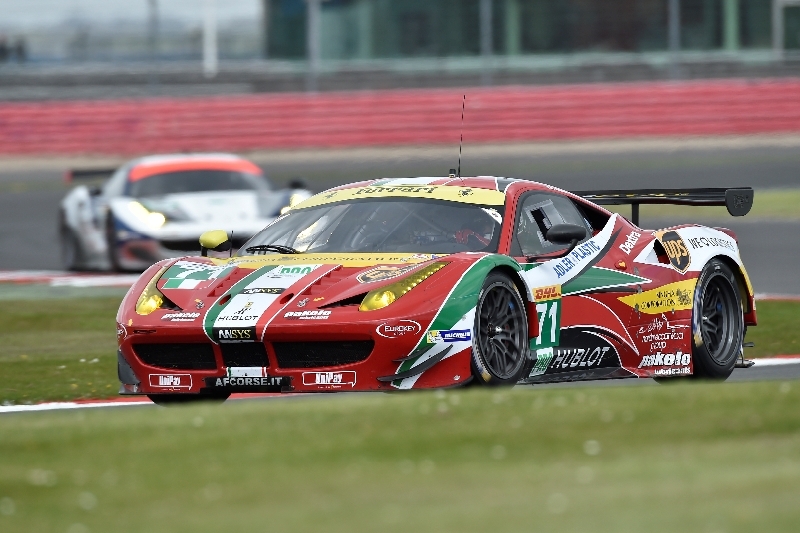 There’s a third Ferrari taking part in the LMGTE PRO class, entered by RAM Racing that last year won the European Le Mans Series (ELMS) with Matt Griffin and Johnny Mowlem. 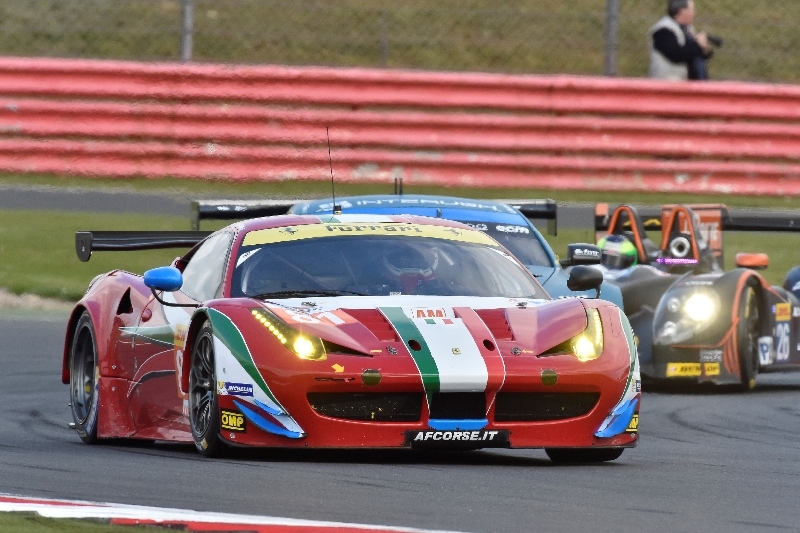 Griffin is back behind the wheel, while Mowlem, now driving for the same team in the LMGT AM category, with Mark Patterson and Ben Collins, has ben replaced by the quick Portuguese driver Alvaro Parente, who came close to making an F1 debut with the Virgin team. 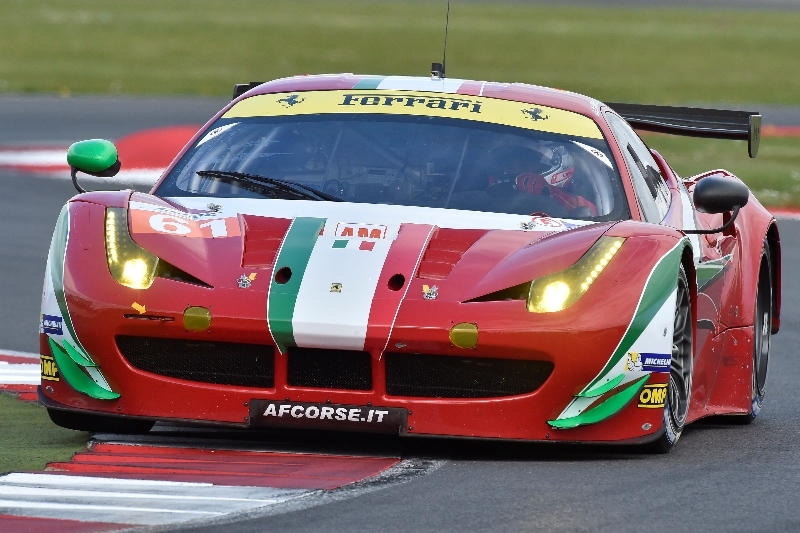 In the LMGTE AM series, AF Corse has strengthened its driver line-up to boost its chances, taking on the talented Steve Wyatt also competing in the APAC Ferrari Challenge and Michele Rugolo. 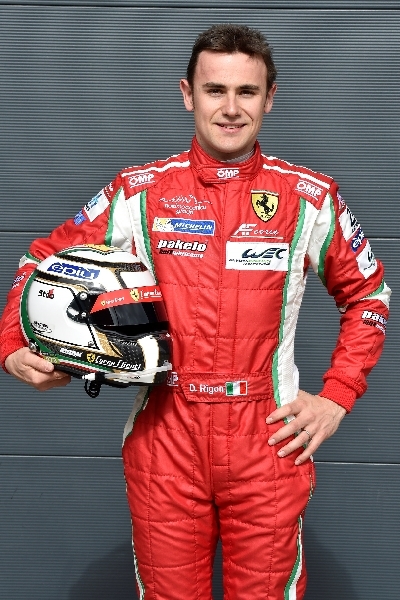 Alongside them is Englishman Sam Bird, another GP2 man, who can boast of six wins and the runner-up position in the 2013 championship, which was won by Switzerland’s Fabio Leimer. 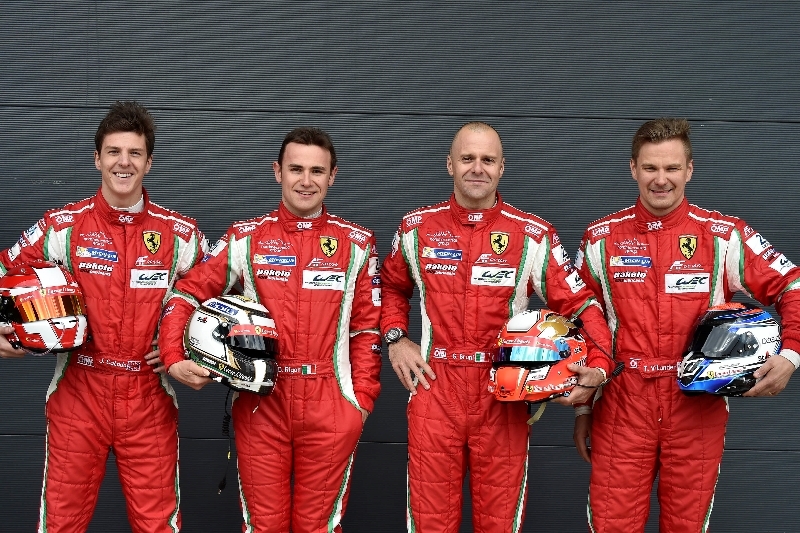 In the team’s other car are the Argentine Luis Perez Companc and the Italians Marco Cioci and Mirko Venturi. 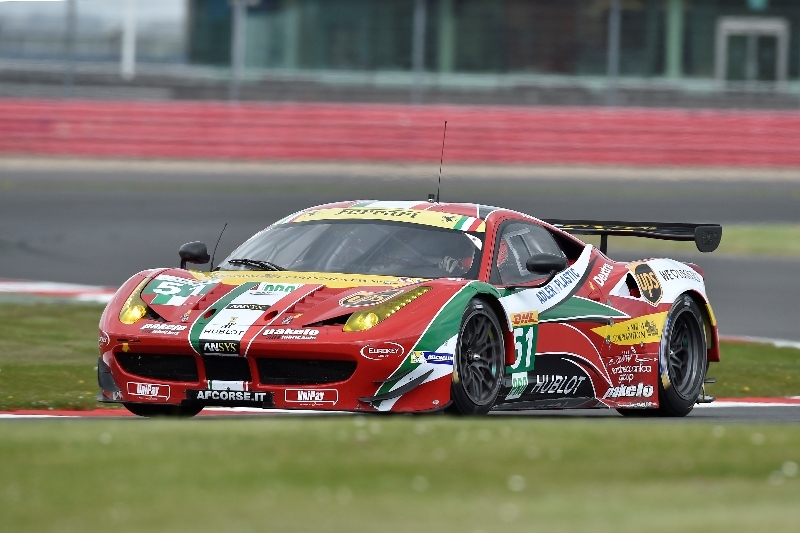 Rounding off the Ferrari entries in LMGTE AM is the 8 Star Motorsports 458 Italia, in the hands of the rapid Paolo Ruberti and two veterans, Gianluca Roda and Enzo Potolicchio. 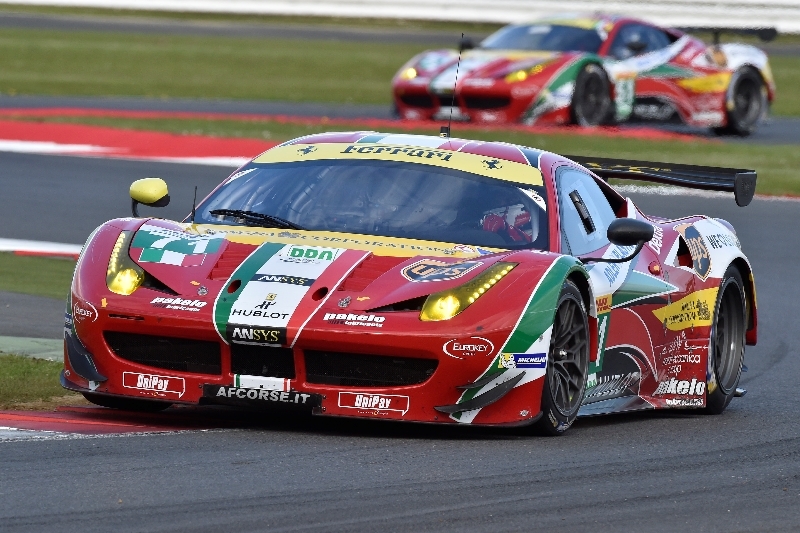 Maranello, 16 April – Sunday at Silverstone sees the first round of the FIA WEC series, the World Endurance Championship in which Ferrari will be aiming to repeat its triple title winning exploits of 2013. 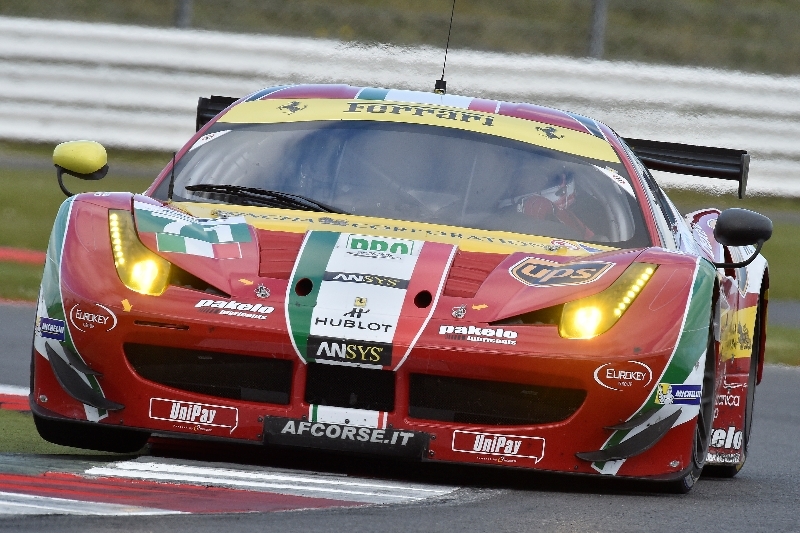 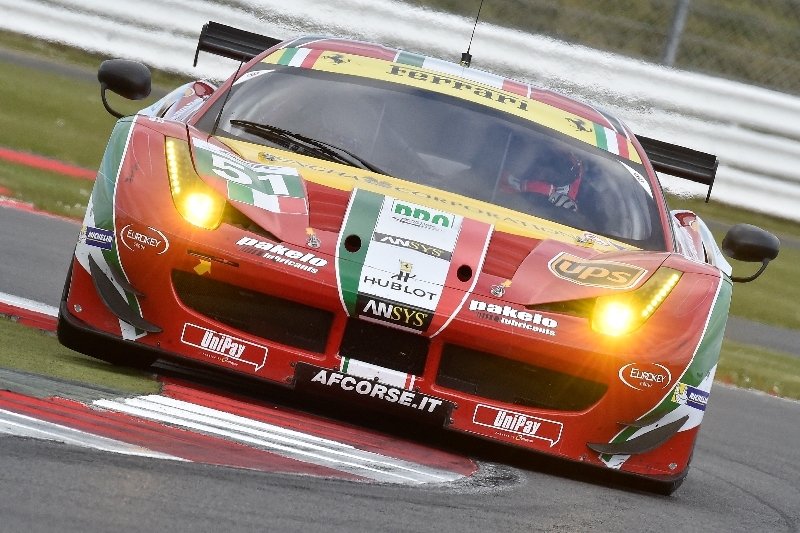 Last year, the 458 Italia GT2 secured the Constructors’, Drivers’ with Gimmi Bruni and Teams’ with AF Corse. 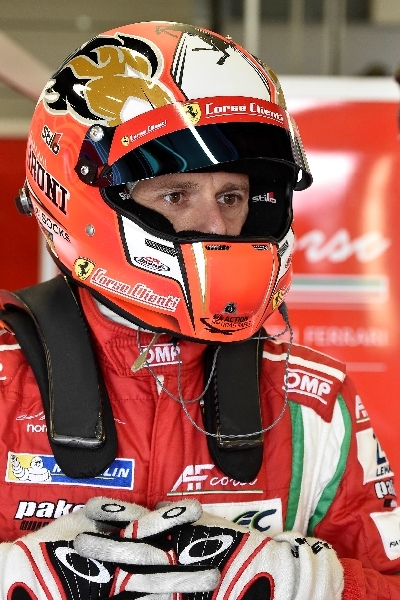 This time AF Corse has decided to field two very different crews in the LMGTE PRO category. 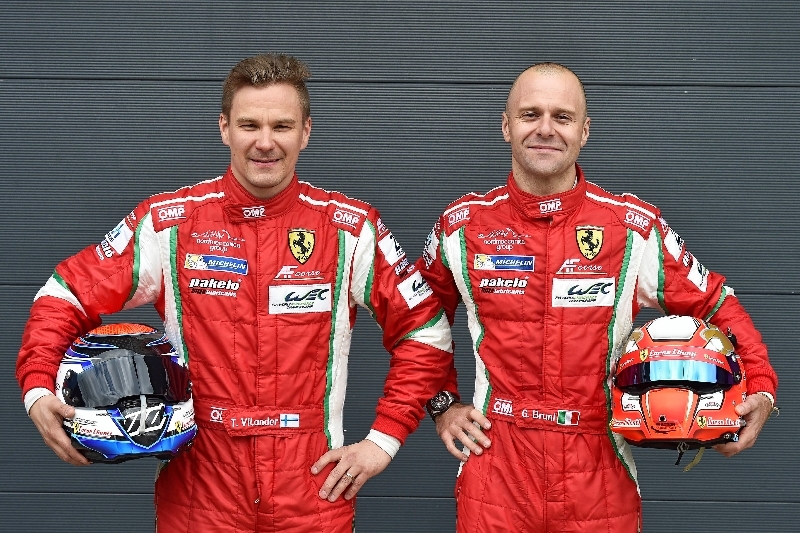 World Champion “Gimmi” Bruni will team up with experienced Finn Toni Vilander in car 51, while at the wheel of the other 458 Italia GT2, car 71 will be two young drivers. 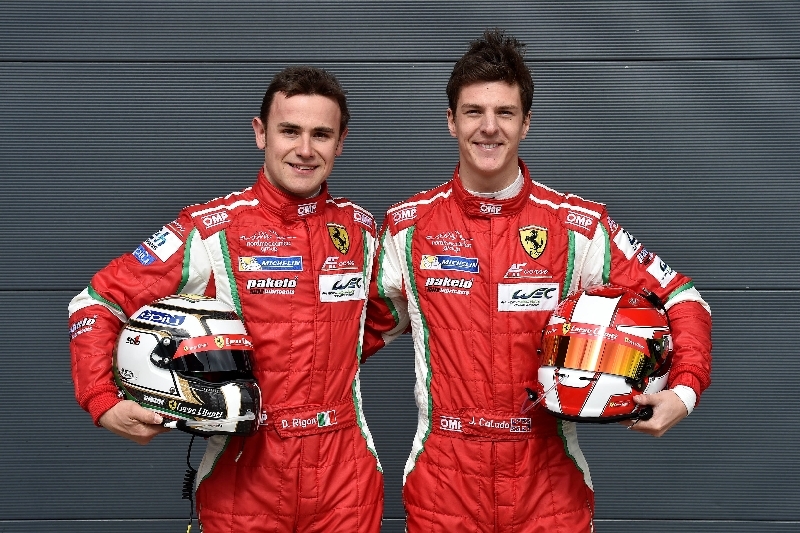 One is a test driver for the Scuderia Ferrari F1 team, the Italian Davide Rigon and the other is the British driver James Calado, who came third in last year’s GP2 championship and has driven in the Friday morning free practice sessions for Force India at five Grands Prix in 2013.